Defense Minister Hulusi Akar shakes hands with NATO Secretary-General Jens Stoltenberg during a NATO defense ministers meeting in Brussels, Feb. 13, 2019. Turkey's NATO journey started 67 years ago this month, just three years after the founding of the organization, and has survived until today with various ups and downs. The relationship has been fluctuating despite both sides being committed to the alliance and gaining mutual benefits from it. Wednesday, NATO defense ministers gathered in Brussels for a two day meeting. 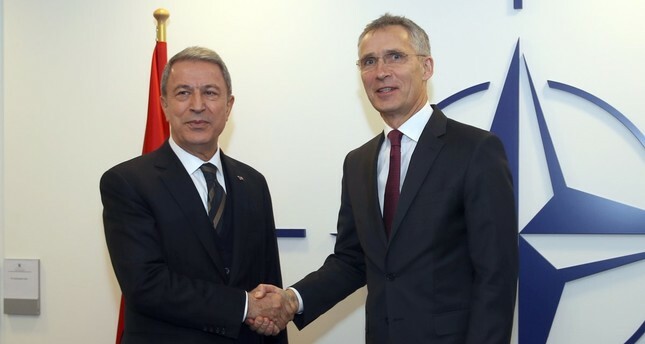 Turkey, represented by Defense Minister Hulusi Akar, on the sidelines of the meeting met with his Greek counterpart Evangelos Apostolakis, where the two discussed current issues between their countries. Both Turkey and Greece became members of the NATO in 1952, as part of the first enlargement movement of the organization. However, joining the organization came at a cost; Turkey first fought besides NATO members in the Korean War, losing 721 soldiers, then became eligible to be a member of the organization, as its previous attempts to join it were unsuccessful. Currently NATO has 29 members and is meant to be a collective defense organization; to defend indivisible security, freedom and common values of its members. Membership to the organization was seen by Turkey as something that may make a positive contribution to the country's economic, military and political development. Since then Turkey has been a vital ally, providing NATO a connection to the east and control of Turkey's straits. "Turkey attaches the utmost importance to NATO's role in maintaining security and stability in the Euro-Atlantic area and in providing a forum for political-military consultations on topics of interest to its members," according to Turkey's Foreign Ministry regarding relations with NATO, adding, "Indivisibility of alliance security, solidarity among allies and a fair risk and burden sharing as well as the consensus rule, are NATO's guiding principles and should remain as such." Turkey, which has the second largest army within the organization after the U.S., is one of the framework nations of NATO within the Resolute Support Mission in Afghanistan and acts as the leading country in the Kabul region. As part of its duties as a NATO country in Kabul, Turkey also protects the Hamid Karzai Airport in Afghanistan. The country also has been providing permanent naval assistance to NATO missions in the Aegean Sea while leading regional initiatives, including Standing NATO Maritime Group's (SNMG) activities in the Black Sea region. Turkey also hosts many NATO initiatives. There is a NATO headquarters in western İzmir province, an air base in southern Adana province, another one in Diyarbakır and a NATO Rapid Deployable Corps in Istanbul. It is also hosts the AN/TPY-2 radar in eastern Malatya province as part of the organization's missile shield project. Apart from all these, in 2018 alone, Turkey contributed $101 million to the common funding of NATO. As one of the countries that contribute the most to the organization's mission, Turkey expects support from NATO in every aspect and is ready to act the same way in return. However, although the country's NATO journey is full of joint missions, it is also full of disappointments and let downs. The first disappointment came in 1964, when Turkey decided to take action in Cyprus where the Turkish Cypriots were suffering under the Greek Cypriots. The U.S. president at that time, Lyndon B. Johnson, sent a letter to Turkish President İsmet İnönü, saying that in case of an invasion on the island, NATO would not side with the country. Known as the "Johnson's Letter," the incident became the first of many lets downs by NATO and left a negative impression on Turkish society. In 1974, the U.S.' disappointing attitude continued with an embargo on arms sales to Turkey following the country's intervention in Cyprus once again. The Cyprus case and the U.S.' and NATO's attitude during the process has never been forgotten by Turkey and created the beginning of anti-NATO and anti-U.S. sentiment within the country, which has continued decades later. One of the reasons behind the continued negative feelings against NATO is the organization's stance against Turkey's fight against terrorism, particularly the PKK. In the late 1990's, when the fight against the PKK was at its height in Turkey, particularly in the eastern regions of the country, Germany claimed that Turkey was using weapons against civilians and issued an embargo on the country instead of supporting its fight. Over time, siding with terrorists rather than Turkey became a pattern for many NATO member countries, particularly the U.S. The U.S. has supported the PKK's Syrian affiliate the People's Protection Units (YPG) in Syria for years now, despite Turkey's warnings that the group is a security threat for them. Ankara has been infuriated by U.S. support for the Syrian Democratic Forces (SDF), which is dominated by the YPG, under the pretext of fighting Daesh. The U.S. has provided military training and supplied truckloads of weapons to the YPG, disregarding warnings from Ankara that partnering with one terrorist group to fight another is not acceptable. Turkey says the weapons are ultimately transferred to the PKK, which is designated as a terror group by the U.S., Turkey and the EU, and used against Turkey. Regarding the Gülenist Terror Group (FETÖ), NATO has shown some support to Turkey. On the first anniversary of the failed coup attempt in Turkey, NATO Secretary-General Jens Stoltenberg said, "I reiterate my strong message that any attempt to undermine democracy in any of our allied countries is unacceptable." FETÖ, led by U.S.-based Fetullah Gülen, sought to topple the Turkish government and seize power on July 15, 2016. The coup attempt was prevented by loyal military troops, police units and millions of Turkish citizens. Some 250 people, mainly civilians, were killed by putschist soldiers. Still, the U.S., despite receiving evidence regarding FETÖ's role in the coup attempt has not extradited Gülen to Turkey. NATO also failed Turkey in supporting the country from the destructive nature of the civil war in Syria. In 2012 Turkey asked NATO patriot missiles be placed on its borders to secure them. However, although the missiles were in Turkey for some time, before long, the NATO countries took them back, leaving Turkey alone to defend itself. In 2017, in what was a humiliating incident for Turkey, during a joint NATO military exercise in Norway, a picture of Mustafa Kemal Atatürk the founder of Turkey was placed among the pictures of "enemy states." During that time a fake Facebook account was also issued under the name of President Recep Tayyip Erdoğan with posts favoring "enemy states." After Turkish military officials took notice of the incidents, the necessary measures were taken by NATO and a promise was issued to Turkey. Despite this fluctuating relationship, NATO continues to express Turkey's worth in the organization, saying that it is a strategic ally. "Turkey is important for NATO but NATO is also important for Turkey. The alliance is based on the core principle of 'one for all and all for one,'" Stoltenberg told Anadolu Agency at the NATO headquarters in Brussels ahead of his official visit to Turkey on April 16.